The bubble which is 0.001 mm to 0.05 mm big is defined as micro-nano-bubble (ultrafine bubble). Windows Media Player(freeware) and Macromedia Flash Player(freeware). Click the icon, and follow the download procedure to install them. in the fields of nature: water in the river, pond and sea. in the fields of industry: factory wastewater, drinking and sewage water. in the fields of fishery: aquafarming. They are echo-friendly indeed because they never cause any chemical reaction to produce harmful material. Gas containing liquid is primarily agitated in the pump to form bubbles. 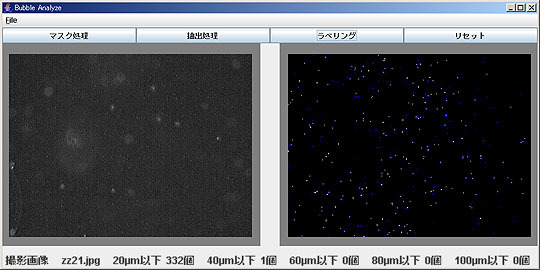 The Micro-Nano-Bubble generator re-bubblizes them into ultrafine sizes not bigger than 50µm(0.05mm). The capacity ranges from 500l/min. to 6000l/min, the largest ever developed in the world. 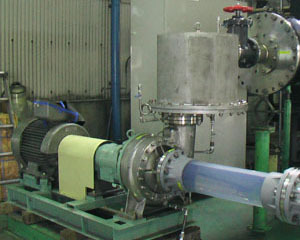 Micro-Nano-Bubble generator built-in pump with the capacity from 500 to 6000 l/min. stably generates ultrafine bubbles. An advanced model with the capacity up to 15000 l/min. is now under development. The pump can handle air containing liquid up to 7%. Most of the bubbles are smaller than 0.02mm (20µm) in diameter. This technology is under patent application. Video image taken by a digital micro scope magnified by 50 times. Bubble diameters measured by an analysis softwear. The ballast water of ocean going ships has a high chance to generate negative effects on the marine environment by spreading harmful or non-native microorganism unless disinfection treatment is taken before it is disposed into the sea. The negative impacts may include the destruction of ecological system, damage to fishing industry or direct attack to human bodies. Ozone is believed to be very suitable for disinfecting the ballast water thanks to its strong bacteriostatic action which Micro-Nano-Bubble generator built-in pump optimizes by transforming the ozone into ultrafine bubbles. Micro-nano bubble effect on ozone water. If the ozone water is not ultrafined, ozone effect will terminate within one to two hours. Impact pressure that the Micro-Nano-Bubble generator built-in pump generates is strong enough to kill microorganism. The capacity of the Micro-Nano-Bubble generator built-in pump ranges from 200 m³ to 500 m³ per hour.